So Lila Felix and I are co-writing the second installment of our Forged in Fire series!!!! 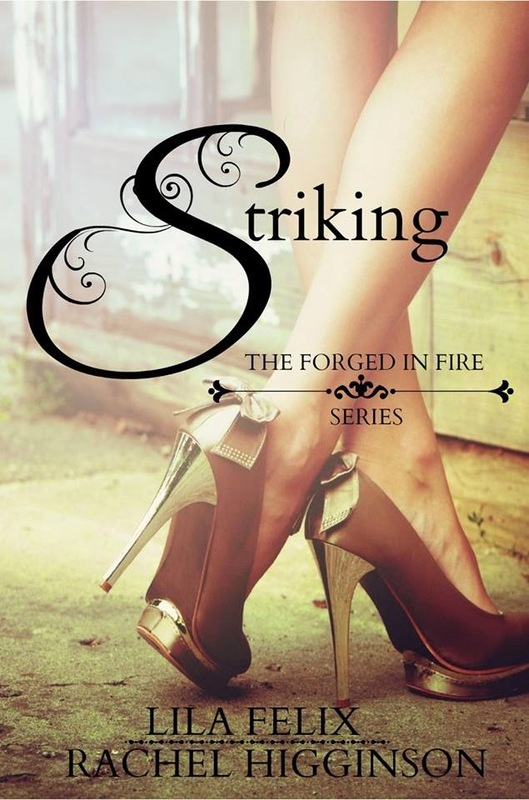 Striking is the first book in that series and you can buy it HERE! Brazing, the second book in the series, will come out the first part of September!!! I love these stories. So much. First, they are contemporary and something completely different than anything I would have come up with on my own. Second, I write them with Lila and you should know that I just love her to pieces!!!!!! Actually... she's from Louisiana. So in my head I call her my BGFF. My best good friend forever. You know? From Forest Gump. Bubba is always like, "Forest, you're my best good friend." So Lila is my BBGFF. My Book Best Good Friend Forever. Enough of that? Yep. That's what I thought. Ok. So when we started looking for covers for Brazing, we found this GORGEOUS picture that we just had to use because it fit the story so well. Well, once we found that picture then we decided we needed to redo Striking to match the aesthetic. So today is really a double cover reveal!!! Here is the cover for Brazing!!!! Crap. Now that song is stuck in my head. And I only know that ONE part of it. Here is Striking. And it is beyond beautiful. Not to mention I need both of these pairs of shoes. Stat. Can two hearts be forged into one? Cami Montgomery stole a car and smashed it into the front of a building in upscale Beverly Hills after a lousy date with the epitome of sleaze balls. The worst part, her parents are following through on threats after this latest plea for attention. Banished from her L.A. paradise and plunged into the Appalachian Mountains with her industrious aunt and uncle, Cami is about to find out how precious life really is. Stockton Wright has been thrust into a hard life. He sacrifices everything to give his family and community what they need. He’s exhausted from life and work—and he’s only twenty four. What he needs is some change, and some sunshine. Even he will agree to that. He just doesn’t expect to find it in a stuck up, pompous, entitled Californian. Cami bursts into Stockton’s life like wildfire, consuming all his thoughts and tangling him in her web. What starts out as a contentious rivalry evolves into a desire neither of them expected. When hammer meets metal, will they crack under pressure or be forged as one? Cami and Stockton might just end up being exactly what the other one needs, but first their love will have to be drawn out in fire.